Death just might be one of the most misunderstood subjects today. To many it is enshrouded in mystery and evokes dreaded feelings of fear, uncertainty, and even hopelessness. 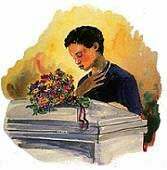 Others believe that their deceased loved ones are not dead at all, but instead live with them or in other realms! Still others are confused about the relationship between the body, spirit, and soul. But does it really matter what you believe? Yes... absolutely! Because what you believe about the dead will have a profound impact on what happens to you in the end-times. There's no room for guessing, so this Study Guide will give you exactly what God says on this subject. Get ready for a real eye-opener! 1. How did we get here in the first place? The spirits of both the righteous and the wicked return to God. Their bodies return to dust. Answer: The body turns to dust again, and the spirit goes back to God, who gave it. The spirit of every person who dies--whether righteous or wicked--returns to God at death. There is nothing mysterious about the spirit that returns to God at death. It is the breath of life. 3. What is the "spirit" that returns to God at death? Answer: The spirit that returns to God at death is the breath of life. Nowhere in all of God's book does the "spirit" have any life, wisdom, or feeling after a person dies. It is the "breath of life" and nothing more. Answer: A soul is a living being. A soul is always a combination of two things: body plus breath. A soul cannot exist unless body and breath are combined. God's Word teaches that we are souls. Answer: According to God's Word, souls do die! We are souls, and souls die. Man is mortal (Job 4:17). Only God is immortal (1 Timothy 6:15, 16). The concept of an undying, immortal soul goes against the Bible, which teaches that souls are subject to death. "All that are in the graves shall hear his voice, And shall come forth." John 5:28, 29. "David ... is both dead and buried, and his sepulchre is with us unto this day." "For David is not ascended into the heavens." Acts 2:29, 34. "If I wait, the grave is mine house." Job 17:13. Answer: No, people do not go either to heaven or hell at death. They go to their graves to await the resurrection day. "The living know that they shall die: but the dead know not any thing, neither have they any more a reward; for the memory of them is forgotten. Also their love, and their hatred, and their envy, is now perished; neither have they any more a portion for ever in any thing that is done under the sun." "There is no work, nor device, nor knowledge, nor wisdom, in the grave, whither thou goest." Ecclesiastes 9:5, 6, 10. "The dead praise not the Lord." Psalms 115:17. 8. But can't the dead communicate with the living, and aren't they aware of what the living are doing? "So man lieth down, and riseth not: till the heavens be no more, they shall not awake, nor be raised out of their sleep." "His sons come to honour, and he knoweth it not; and they are brought low, but he perceiveth it not of them." Job 14:12, 21. "Neither have they any more a portion for ever in any thing that is done under the sun." Ecclesiastes 9:6. Answer: No, the dead cannot contact the living, nor do they know what the living are doing. They are dead. Their thoughts have perished (Psalms 146:4). Jesus calls death "sleep." It is a state of total unconsciousness. 9. Jesus called the unconscious state of the dead "sleep" in John 11:11-14. How long will they sleep? "The day of the Lord will come ... in the which the heavens shall pass away." 2 Peter 3:10. Answer: The dead will sleep until the great day of the Lord at the end of the world. In death, humans are totally unconscious with no activity or knowledge of any kind. The righteous will be raised to life and given immortality at Jesus' second coming. "Behold, I come quickly; and my reward is with me, to give every man according as his work shall be." Revelation 22:12. "The Lord himself shall descend from heaven with a shout, ... and the dead in Christ shall rise ... and so shall we ever be with the Lord." 1 Thessalonians 4:16, 17. "We shall all be changed, In a moment, in the twinkling of an eye, ... and the dead shall be raised incorruptible. ... For this corruptible must put on incorruption, and this mortal must put on immortality." 1 Corinthians 15:51-53. The devil's first lie to Eve was "You won't die" - a statement completely contrary to all Scripture. 11. What was the devil's first lie? "And the serpent said unto the woman, Ye shall not surely die." Genesis 3:4. "That old serpent, called the Devil, and Satan." Revelation 12:9. Answer: Satan told Eve that sin would not bring death. "Ye shall not surely die," he said. Those who believe the dead are alive become easy targets for the devil's deceptions. 12. Why did the devil lie to Eve about death? Could this subject be more important than many think? 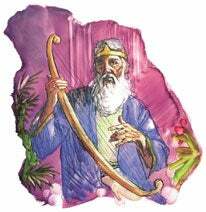 In the end-time Satan will again use sorcery as he did in Daniel's day to deceive the world (Revelation 18:23). Sorcery is a supernatural agency that claims to receive its power and wisdom from the spirits of the dead. Posing as godly loved ones who have died, saintly clergymen who are now dead, Bible prophets, or even the apostles or disciples of Christ (2 Corinthians 11:13), Satan and his angels will deceive billions. Those who believe the dead are alive, in any form, will most assuredly be deceived. "They are the spirits of devils, working miracles." Revelation 16:14. "For there shall arise false Christs, and false prophets, and shall shew great signs and wonders; insomuch that, if it were possible, they shall deceive the very elect." Matthew 24:24. Answer: Yes, indeed! Devils work incredibly convincing miracles (Revelation 13:13, 14). Satan and his angels will appear as angels of light (2 Corinthians 11:14) and, even more shocking, as Christ Himself (Matthew 24:23, 24). The universal feeling will be that Christ and His angels are leading out in a fantastic worldwide revival. The entire emphasis will seem so spiritual and be so supernatural that only God's elect will not be deceived. The elect will not be deceived, because they firmly reject everything that is contrary to Scripture. "They received the word with all readiness of mind, and searched the scriptures daily, whether those things were so." Acts 17:11. "If they speak not according to this word, it is because there is no light in them." Isaiah 8:20. 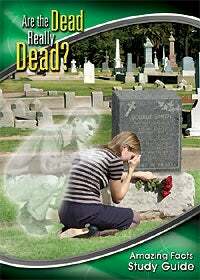 Answer: God's people will know from their earnest study of His book that the dead are dead, not alive. Spirits of the dead do not exist. Therefore, God's people will reject all miracle workers and teachers who claim to receive special "light" or work miracles by contacting the spirits of the dead. And God's people will likewise reject as dangerous and false all teachings that claim the dead are alive in any form, anywhere. In Moses' day, people who claimed power to communicate with the dead were stoned to death. 15. Back in Moses' day, what did God command should be done to people who taught that the dead were alive? "A man also or woman that hath a familiar spirit, or that is a wizard, shall surely be put to death: they shall stone them with stones." Leviticus 20:27. Answer: God insisted that wizards and others with "familiar spirits" (who claimed to be able to contact the dead) should be stoned to death. 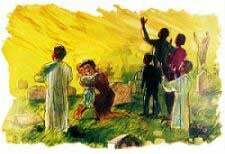 This shows how God regards the false teaching that the dead are alive. No one in God's new kingdom will ever die. Death will cease at the destruction of Satan. "They which shall be accounted worthy to obtain that world, and the resurrection from the dead, ... Neither can they die any more." Luke 20:35, 36. "And God shall wipe away all tears from their eyes; and there shall be no more death, neither sorrow, nor crying, neither shall there be any more pain; for the former things are passed away." Revelation 21:4. Answer: No! Death, sorrow, crying, and tragedy will never enter into God's new kingdom. Reincarnation is impossible. Because God says all who died, both good and evil, are in their graves. "The living know that they shall die: but the dead know not any thing. ... Neither have they any more a portion for ever in any thing that is done under the sun." Ecclesiastes 9:5, 6. Those who insist on Scripture proof for all doctrines will not be led astray by Satan. 18. I am thankful for the Bible, which tells us the truth on this sensitive subject of death. 1. Didn't the thief on the cross go to paradise with Christ the day He died? No. In fact, on Sunday morning Jesus said to Mary, "I am not yet ascended to my Father." John 20:17. This shows that Christ did not go to heaven at death. Also note that the punctuation of the Bible is not inspired, but was added by men. The comma in Luke 23:43 should be placed after the words "to day" rather than before, so the passage should read, "Verily I say unto thee to day, shalt thou be with me in paradise." Or, "I'm telling you today--when it seems that I can save no one, when I myself am being crucified as a criminal--I give you the assurance today that you will be with me in paradise." Christ's kingdom is set up at His second coming (Matthew 25:31), and all the righteous of all ages will enter it at that time (1 Thessalonians 4:15-17) and not at death. 2. Doesn't the Bible speak of the "undying," "immortal" soul? No, the undying, immortal soul is not mentioned in the Bible. The word "immortal" is found only once in the Bible, and it is in reference to God (1 Timothy 1:17). It goes nowhere. Instead, it simply ceases to exist. Two things must be combined to make a soul: body and breath. When the breath departs, the soul ceases to exist because it is a combination of two things. When you turn off a light, where does the light go? It doesn't go anywhere. It just ceases to exist. Two things must combine to make a light: a bulb and electricity. Without the combination, a light is impossible. So with the soul; unless body and breath are combined, there can be no soul. There is no such thing as a disembodied soul. 4. Does the word "soul" ever mean anything other than a living being? Yes, it may mean also (1) life itself, or (2) the mind, or intellect. No matter which meaning is intended, the soul is still a combination of two things (body and breath), and it ceases to exist at death. 5. Can you explain John 11:26, which says, "And whosoever liveth and believeth in me shall never die"? 6. Matthew 10:28 says, "Fear not them which kill the body, but are not able to kill the soul." Doesn't this prove that the soul is undying? 7. Doesn't 1 Peter 4:6 say the gospel was preached to dead people? No, it says the gospel "was" preached to those who "are" dead. They are dead now, but the gospel "was" preached to them while they were yet living. 8. What about the souls crying out from under the altar in Revelation 6:9, 10? Doesn't this show that souls do not die? No. This cry was figurative, as was the cry of Abel's blood (Genesis 4:10). The word "soul" here means people (or living beings) who had been slain for their faith. Surely no one believes that souls who die literally lie under the altar, nor do people believe that the righteous beg God to punish their enemies. Rather, the righteous beg for mercy for their enemies, as Christ did on the cross (Luke 23:34). 9. Doesn't the Bible say Christ went and preached to lost souls in hell between His crucifixion and resurrection?